Smooth travel in general, and business travel in particular, comes down to a number of factors, from choosing the best seat for your flight to taking the appropriate tech for your needs. Not to be overlooked is your choice of bag. That is where Everki’s Atlas wheeled notebook backpack really comes to the fore. So, you are back to choosing between a wheeled trolley or backpack. The former is a breeze to navigate interminably large airports, with their own trains that connect vast terminals. Yes Heathrow and Atlanta, we’re talking about you. 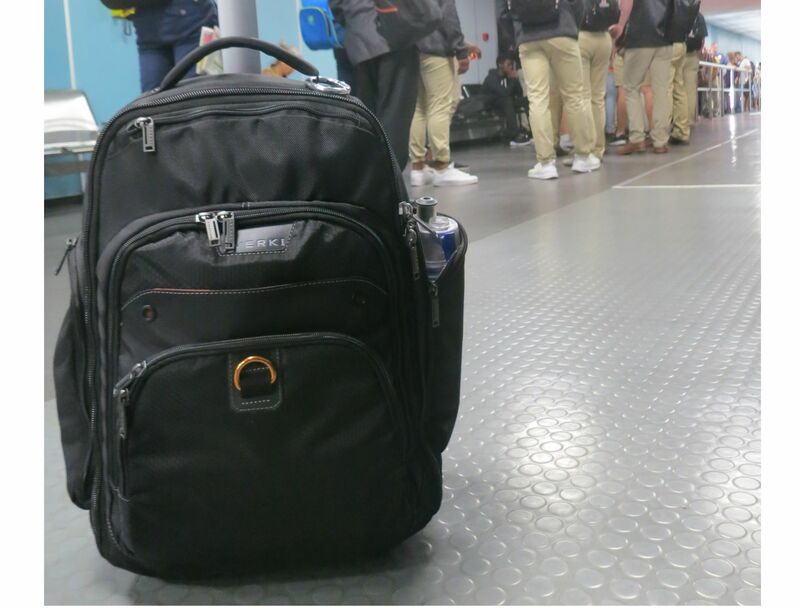 Backpack’s however, leave you with both hands free, which can be a boon when you are doing a bit of shopping in an airport or having a snack while walking to your gate. 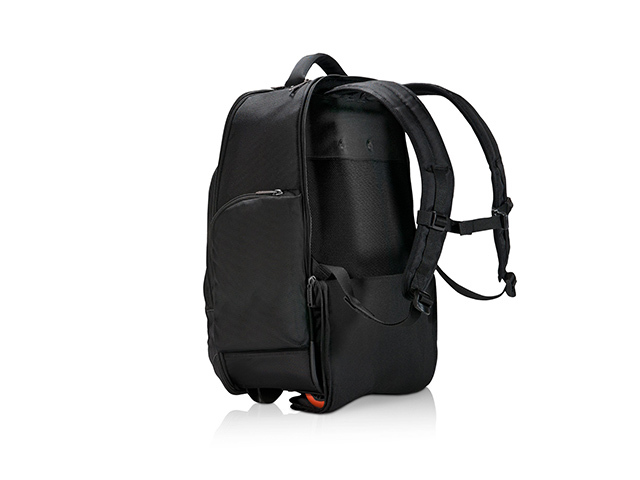 That is where Everki’s Atlas Wheeled notebook backpack really comes into its own, as the bag performs excellently at both functions. Firstly, it looks smart and classy, without hinting that you are an ideal target for thieves, which is more than I can say for the leather adorned business luggage out there. What is evident from the outset is that it is built to last, with the materials and zippers used in it clearly being top notch. 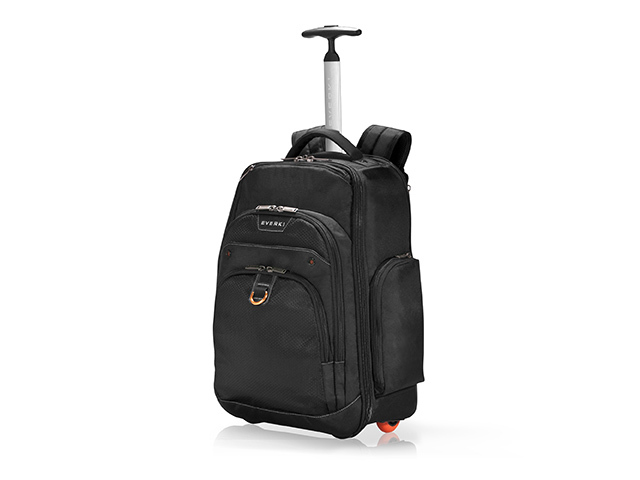 With dimensions of 40 x 20.3 x 54 cm, it also just meets the criteria for most airlines for a carry on bag. But, with a 30 litre capacity, it can hold a great deal, with the notebook insert alone catering for 13” to 17” notebooks. The bag really consists of three main compartments. 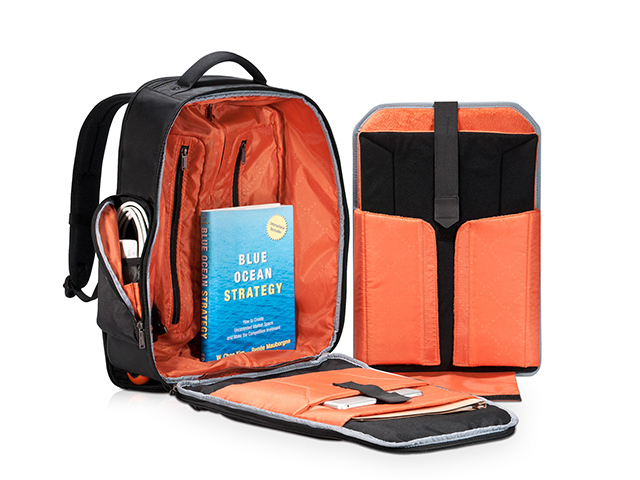 The large internal one enables you to pack a few clothes, ideal for a weekend or short business trip, and also caters to a well padded sleeve which contains, and protects, your notebook. The sleeve though, which is secured to the main compartment by velcro, is fully removable, which makes this compartment a bit more customisable according to your needs. Also supported in the main compartment is a separate cushioned partition for a tablet, and another for notes or papers. 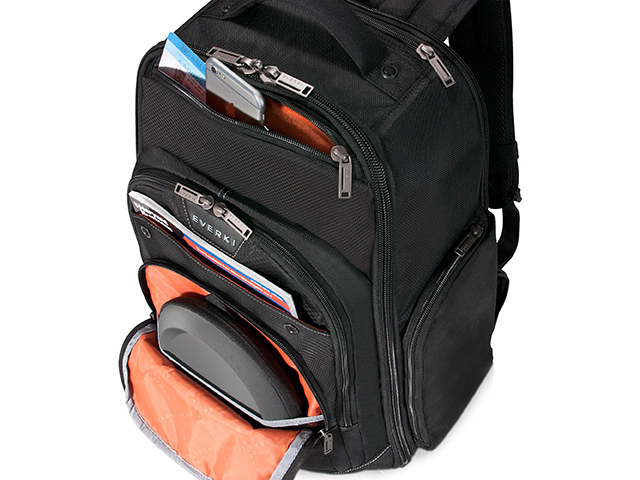 The secondary zipped compartment is where you could store the likes of portable hard drives, your notebook power cable, pens and business cards, and pretty much anything else that you want within easy reach. This section has a few smaller zipped partitions of its own, ideal for those smaller items that have a habit of going AWOL right when you need them. Finally, the third compartment, which is the smallest of the other two, caters to other odds and ends, such as an ereader, batteries, and chargers. On the sides, you get two large pockets, one expressly intended for a water bottle (which I highly encourage taking with you). It’s worth noting though you can actually get quite a lot in these pockets, which makes then handy for items you want to reach quickly. Speaking of, one of the clever features of the bag is a small zippered pocket right at its top, ideal for your smartphone, keys, passport and wallet, in other words, those essential items that you don’t want to have to scrounge through larger sections of the bag to find. Also at the top is a large handle, which makes varying the bag vertically, or removing it from overhead bins, considerably easier. As with many of Everki’s other offerings, the inner lining is orange for a reason - it is intended to make finding your stuff within its folder in a bit easier. I found the contrast does aid in a darkened airplane in this regard. Another thoughtful touch, especially considering the security risks associated with going through an airport, is a special RFID protected pocket. This is intended to help you keep your chipped passport and credit cards from being illegally scanned for nefarious purposes. On a recent business trip to Cape Town, the Atlas was a joy to use. Its large wheels made wheeling it through the airport a pleasure, while getting it on and off the plane – and fitting it into a smaller than usual overhead bin, was a breeze. That brought to mind a really important point. Even if your luggage does conform to the airline’s specifications, depending on the plane, your seat, and how full your flight may be, you definitely want your bag to be able to fit in smaller than average/ crammed compartments, and not require the largest overhead storage bin possible. Happily, the Atlas scored full marks on this front on a particularly full return flight. Furthermore, the handle, which slides out of its own zipped pocket is pretty decent. However, it doesn’t extend as far as some other handles out there, which may pose a problem for taller than average individuals. Also worth mentioning is that the handle is on a single shaft, so I did find it slipped down when fully extended occasionally, a minor annoyance when it happened, but not frequently enough to mark the bag down. You may be wondering – how does the Atlas perform as a backpack though? Excellently, in a word. The shoulder straps are large, very well padded and thus comfortable on the shoulders. Additionally, the flap that contains the shoulder straps when not in use, neatly folds down and connects to the bottom of the bag with velcro, covering the wheels, so I didn’t have wheels rubbing into my lower back. Indeed, transitioning between trolley and backpack was smooth and quick. I was able to move back and forth between the two within about 20 seconds. Indeed, the most difficult part of reviewing this bag consisted of staring at it and wishing for another trip so I could put it through its paces again. Finding faults therefore, was a difficult proposition. As with all trolleys, the presence of the wheel and handle does take up a bit of room in the main compartment. I could hardly complain though, considering how much more space the rest of the bag offered, more than making up for whatever was lost. However, as with everything, there is always room for improvement. I would have loved to have seen some kind of waistband being incorporated, so that it distributes more weight onto one’s hips when carrying it on my shoulders, and the inclusion of a side handle that gave yet another way to carry it would have been ideal. That said, even as it stands, the Everki Atlas wheeled notebook backpack is one of, if not the best trolley plus backpack solutions I have come across so far. While it is ideal for business travelers, I would just as wholeheartedly recommend it to any traveler who wants the best of both worlds. The prices for this beauty seem to vary wildly, ranging from around R3 000 to R4 400 online.